The year 2014 ended, for me, with a 2-week-long dive into Federated Wiki Happening (#FedWikiHappening & #FedWiki). With a full house here at home for the Christmas/New Year holidays (a rare and treasured occurrence these days), throwing my hat into the #FedWikiHappening ring for the last two weeks of December seemed a bit optimistic (reckless?) on my part, but despite having limited time it was Oh so worth it. Enormous thanks to Mike Caulfield for inviting me and others to take part, and for his and Ward Cunningham’s work in making it not just possible but a lively and messy, even passionate, exploration of federated wiki collaboration. Smallest Federated Wiki is the work of Ward Cunningham. At its simplest, the notion of federated wiki moves beyond the “consensus engine” of wikis like Wikipedia, where individual contributions on a particular topic cohere towards one accepted, canonical version. In a federated wiki, you write as you wish, adding your own pages to the wiki, and forking and editing pages created by others. A significant feature of a federated wiki is that different versions of ideas (pages) can exist simultaneously, with connections and conversations occurring between them, either in the wiki itself or in the wider social media ecosystem, e.g. Twitter, blogs, etc. My introduction to the federated wiki concept came only recently, through a series of wonderful blog posts by Mike Caulfield (especially this one). The posts seemed to me a kind of deep thinking out loud about identity, networks, cooperation, collaboration and knowledge creation. The posts sparked thinking and conversations amongst quite a few people and some of us ended up participating in Federated Wiki Happening. Mike’s “health warning” at the start of FedWiki Happening was that Federated Wiki is hard to learn, easy to use. I’m not sure I got to the “easy to use” part, but I sure learned a hell of a lot. So many possibilities have arisen in my mind as a result. My existing social media ecosystem – Twitter, blog, Flickr, etc. — seems now less than what it could be. I don’t think federated wiki will replace these identity-driven networks, but it could provide a unique space for idea generation and idea mining. My thinking is running along the lines of how might I/we use federated wiki in learning and teaching? Doing this seems both challenging and important to me, and I hope to continue some of those discussions with others over the next few months. Most of my reflections on federated wiki at this moment, immediately after #FedWikiHappening, are circling around the ideas of identity, authorship, communication and voice. When FedWiki Happening began, each participant was visually represented in the wiki by a simple but unique square, a gradient of two colours. 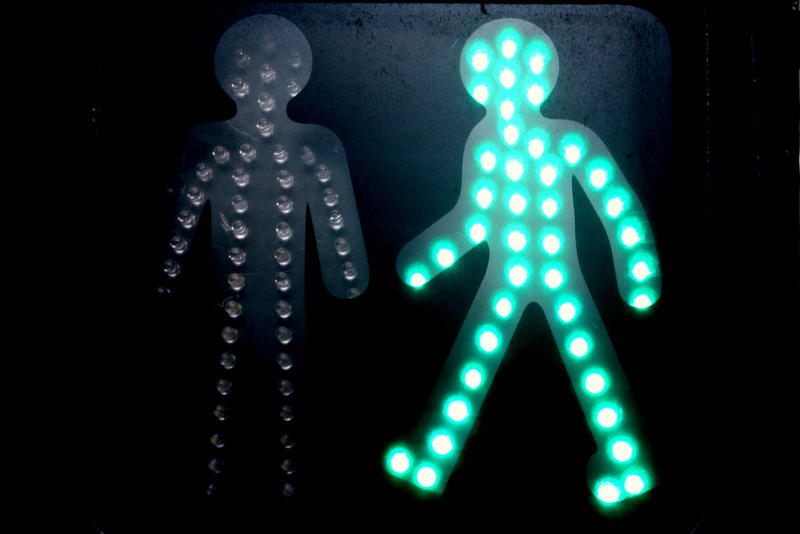 Early on, based on the preferences of many of the participants, personal avatars were added so that individual contributors could be readily identified – contrary to the wiki convention of discoverable but not obvious. This seemingly simple change reflected deeper thinking about identity and collaboration. How important is it to know who has written a particular passage? Is this an absolute judgment or is it contextual? Are we carrying our existing biases (from identity-based social networks) into the wiki or might it be possible, even preferable, to leave behind the typical notions of authorship/ownership – while still leaving traces as to the original authors of particular words and ideas within the wiki? John Udell explored this in an excellent blog post Individual voices in the Federated Wiki chorus (and subsequent comments). Writing in my fedwiki journal gives me the space I need to think without worrying about how interesting I’m being, whether I [am] contributing something new to the conversation. It gets my head out of the stream for a bit. It feels nice, like a personal library of slightly musty books on a beautiful rainy afternoon. Federated wiki can be a unique space situated between sole ownership and no ownership, informed by the values of a gift economy. I write and share my ideas. They are open to change and to challenge, and may become part of someone else’s creation, far beyond what I may have imagined. I can re-appropriate those new ideas and build on them – or not. This is one of most essential values of openness, and indeed of open scholarship. The potential for new modes of authorship, collaboration and knowledge co-creation are here in federated wiki. I was not alone in experiencing numerous struggles in FedWiki Happening, first in getting to grips with FedWiki mechanics – situating myself in a neighbourhood, writing and saving my ideas, forking (what does it really mean? when do I do it?) — but then in jumping into the wiki and interacting with 20 or so other “newbies”. Mike and Ward provided an outstanding level of tech support, care, and wild encouragement to all in FedWiki Happening (kudos and many thanks to them both). We brought our respective experiences and expectations to this new space, a Third Place, and we wrote and wrote (nearly 2000 wiki pages in just over two weeks). Many pages were written in non-personal way (e.g. Chorus of Voices), while others were written in a decidedly first-person way (e.g. Why I don’t like the Chorus of Voices analogy). And there were many, many variations in between. One of the advantages of having “no one way” to write in the federated wiki (is this particular to the Happening, I wonder?) is that all voices, and all forms of voice, were equally accepted – or so it felt to me. It was like a breath of fresh air to read and to write in such a free way within a network of peers. Theory, technology, edtech talk, power, gender, philosophy, literature, poetry, and even recipes became part of the federated wiki fabric. Free connections between these, conversations about the connections, agreement and disagreement flowed – but all within a framework of respect and trust amongst the participants. And there I pause to reflect. The 4 key ingredients of this experience were the federated wiki itself; the support provided by Mike, Ward and others; the participants, open thinkers every one; and the environment of trust, respect and care. All together: a powerful experience which has opened my mind to new possibilities for collaborating, learning, connecting, and being a scholar — not in an institutional-scholar sense, but in the sense of connecting with other thinkers, in both tightly knit and loosely coupled networks, using federated wikis. Much seems possible now. But how to build on what has been done? And how to ensure those 4 magic ingredients? If you’d like to find out more about federated wiki and perhaps become involved, now or in the future, please check out Mike’s summary blog post, and do check out some of these terrific FedWiki posts written by participants. I look forward to continuing the FedWiki thinking and exploring over the next few months, particularly in relation to my research on open education and digital identity. I am grateful to Mike for enabling me to work with him, as well as with some of the most valued people in my networks – Kate Bowles, Frances Bell, Maha Bali, Alan Levine, Whitney Kilgore and others – as well as to meet, connect and collaborate with still more vibrant and generous thinkers, including Alyson Indrunas, John Udell, Jason Green, and, of course, Ward Cunningham. Thank you all. Image: CC BY-SA 2.0 cogdog What’s happening? FedWiki! This 4-week course introduces participants to the tools and practices associated with academics’ participation in online social networks in order to share, reflect upon, critique, improve, validate, and otherwise develop their scholarship. Together we will explore ideas associated with digital scholarship, open scholarship, and social scholarship. I have a keen interest in this topic, as well as being an admirer of George’s work — and of the team of people who will be contributing to the course: Bonnie Stewart, Laura Czerniewicz, and Royce Kimmons. Although the course has a hub on Canvas, I anticipate interacting with other participants mostly through our syndicated blog posts and Twitter (using the hashtag #scholar14), but we’ll see. I am looking forward to the conversations. The course begins on October 20th. Why not consider joining? Check out the links above and/or the conversations on Twitter. I’m jumping into the Connected Courses adventure — here goes!! #ccourses popped onto my radar during the early summer, through Twitter and Flickr feeds (thanks @heloukee 🙂 ) The blog posts and videos and tweets which followed whetted my appetite further. I identify as an open educator and feel deeply not only about helping my students to develop their learning networks and networked learning skills, but about about sharing my ethos with students, and finding out about their practices, preferences, and values. That’s the heart of learning for me — whether it’s IT or poetry or history. I shared some of my thinking about this at #altc last week and here in Navigating the Marvellous, a summary of some thoughts about open learning and education, connecting across boundaries, and power relationships in education. I participated in one of Howard Rheingold’s courses in 2011 (#mindamp). Howard, you modeled so much of what all of this is about, with humour and great insight. Thank you. I still share Howard’s adage with students whenever one of our learning experiments doesn’t go quite, er, as planned: “If you’re not falling off, you’re not on the edge.” I love that Howard addresses all of his students as Esteemed Co-learners. Now for the confession. I’m been blogging for awhile here… but my blog is in need of some major rework. I’d like also to create a self-hosted WordPress blog. I’m immensely grateful for the advice and suggestions from Click, Link and Embed (priceless, guys!) and had hoped to get down to this during this pre-course week, but start-of-semester pressures mean that’s not been possible. So I’m taking a deep breath and just getting started in #ccourses with my blog as is — but stating my intention to get under the hood of my blog later during #ccourses. 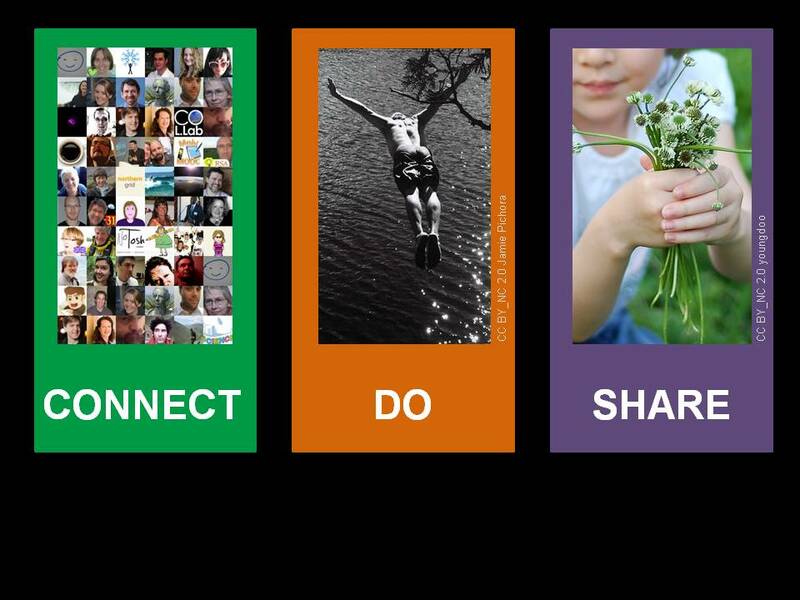 Open Education Week 2014… and an opportunity to use one of @cogdog‘s wonderful #open images (thanks, Alan). This post is a summary of what I’ve been up to in the lead up to Open Education Week 2014 — preparing an #openedweek webinar, working with other open educators, supporting students in open sharing, participating in an inspiring Irish education conference, and finally, recounting a moving coincidence. 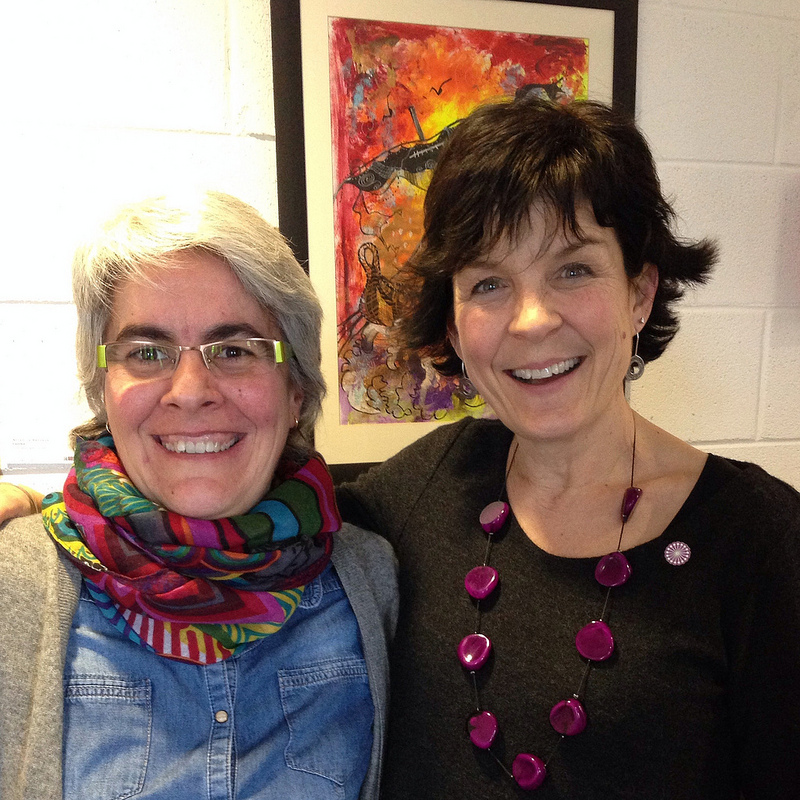 Bea met several educators at NUI Galway — in CELT, Information Technology, and the Centre for Adult Learning & Professional Development — and also spoke with CT231 Professional Skills students and attended their Ignite presentations. Bea made a great impression on students by explaining that she has been able to follow their work online as they share openly via Twitter #ct231 and #icollab, Scoop.it Student Showcase, Flipboard and more. On Saturday, March 1st, we joined over 300 educators from across Ireland at the annual CESI Conference here in Galway. The conference (and CESI TeachMeet on the preceding night) provide a welcome opportunity for primary, secondary, third-level and community educators to meet, to form and strengthen friendships, and to learn from one another. The Irish educator community has a strong online presence via #edchatie, but gatherings such as the CESI and ICTEdu conferences are invaluable. It’s impossible to summarise this inspiring conference in a few words — please check the #cesicon hashtag on Twitter for updates and summaries. I presented and facilitated a workshop at the CESI Conference on Becoming and Being Open Educators, inviting educators to consider their (and their students’) identities and practices with respect to open education. My thanks to all of the educators who participated and who challenged my thinking. Finally, a coincidence. One of the outstanding innovations in Ireland in the past year has been the launch and growth of the Youth Media Team (@YMTfm), a team of secondary students, supported by educators, who attend education-related events, engage with participants, and create and share multimedia reports on the spot — photos, interviews and blog posts. Two weeks ago at the CESI Conference, Dave and Finn recorded a conversation between Laurence Cuffe and myself during which we shared our discovery of a moving coincidence — spanning the years 1968 to 2014. Like many educators I know, the start of 2013 has been about MOOCs. I’ve been participating in #etmooc — the Educational Technology & Media MOOC started by Alec Couros, Alison Seaman and a great team, and #edcmooc — E-learning & Digital Cultures, organised by another great team at the University of Edinburgh (and hosted by Coursera). Both have gotten off to lively starts, with thousands participating and activity spread across Google+ Communities, Twitter, Facebook, course blogs and thousands of participant blogs, among other places. Before diving headlong into Digital Storytelling (Week 4 of #etmooc) and metaphors of the Future in Digital Culture (Week 2 of #edcmooc), I’m pausing to reflect on the learning process, or rather my personal learning process in these courses. I’d participated in other connectivist or cMOOCs previously but only intermittently; a few sessions each of Change11 and #CFHE12 last year. To be honest, I didn’t make a full commitment to either, but in each case I engaged with new ideas, new blogs and new people — all of which was valuable. My intention this time was to bring something different to my MOOC participation: focus. Even without participating in every webinar, watching every video or reading every article or blog post, I intend to complete each course from start to finish. Like many other participants, my goals at the start were mixed. I want to learn more, through engaging with others, about the areas being explored in each MOOC (connected learning, the open education movement and digital literacies/citizenship in #etmooc, digital and learning cultures in #edcmooc); to contribute to conversations and sessions in areas where I have experience, both as a learner and a teacher (e.g. digital literacies, digital identity); to learn more, through both observation and participation, about organising and facilitating large, open groups of learners; and to challenge my thinking and reflect on my own learning processes. I may already consider myself an open learner and digital scholar, but the more I change my practices — the more I “unlearn” — the more I uncover assumptions and practices which can be (need to be) challenged even further. Three weeks into #etmooc and one week into #edcmooc… and the water is fine. I started with #etmooc and the energy created there has been phenomenal. In some ways, this has detracted from my #edcmooc experience in that I have less time — but in other ways there is great synergy. This is partly because many people are participating in both MOOCs, but that’s not the only reason. Although I wouldn’t always choose to participate in two MOOCs at once (!) I’m finding that it is possible to be in two MOOC ecosystems at once and to participate and collaborate in and across both. In Dave Cormier’s excellent #etmooc session on Rhizomatic Learning last week — the source for both the title of this blog post and the quote by Alec Couros in the image above — he reviewed his 5 steps to succeed in a MOOC: Orient, Declare, Network, Cluster and Focus. As I’m experiencing, first in #etmooc and now in #edcmooc, connected learning can be powerful when it progresses to networking, clustering and focus. For me this has happened around digital identity — a focus of much of my own learning, teaching and research. Through both Twitter and the Google+ communities for each MOOC, I’ve found others thinking and engaging with the course ideas who are reflecting particularly around issues of identity and digital identity. I’ve engaged in some great discussions after reading thought-provoking blog posts by Angela Towndrow on understanding digital identity and connection, Carolyn Durley on developing a voice as a connected learner, Jen Ross (also a member of the #edcmooc team) on online teacher presence, and (via Jen) Amy Collier on the online teacher’s body. Blogs, and the ensuing conversations, have become my prime place for conversation and learning in both MOOCs. This mightn’t be the same for everyone — but that is the power of open and connected learning. We define our own paths, we make our own connections, we chart our own learning journeys. At the risk of conflating these two MOOCs (there are, of course, differences), in both #etmooc and #edcmooc there is a strong sense of connection and community, despite the huge scale. Regular sessions — webinars, Twitter chats, Google+ hangouts — are like social glue, as Alec Couros describes, objects for sociality and study. The networking and clustering continue in smaller interest-driven groups. Of course not all participants will have the same experience and as the number and variety of MOOCs (both ‘x’ and ‘c’ varieties) expands there’s still much to learn about MOOCs and scale, accessibility and sustainability. However, in the face of the very public failure of another Coursera MOOC this week, #etmooc and #edcmooc are examples of how connectivist MOOCs can work well to facilitate powerful learning. 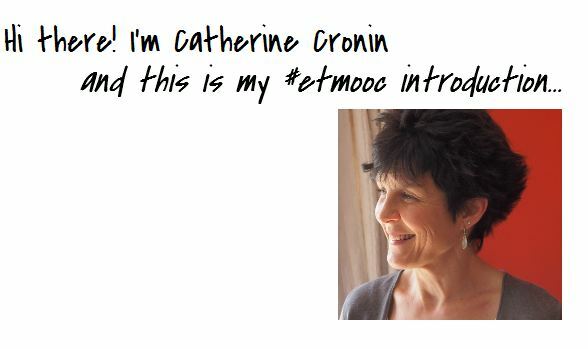 As with most MOOCs, the first week of #etmooc was a whirlwind of navigating new spaces, connecting with new people (as well as some old friends) and getting an overall sense of the course and the community. There’s a positive vibe in #etmooc that I’m enjoying. The Google+ community is proving to be a great place for conversations and sharing ideas, resources and feedback. I welcomed the first week’s challenge of creating an introduction using a new tool. I’d been wanting to try Mozilla Popcorn Maker since learning about it a couple of months ago. Popcorn Maker enables you to enhance, remix and share web content such as links, maps, images, video, audio and live feeds — a unique tool. Well, a few technical setbacks later, and with some expert help from Laura Hilliger, I completed my intro today (not a moment too soon, as it’s the start of Week 2!). A few fascinating #etmooc posts and conversations over the past couple of days… but that will have to wait for my next post. And so it begins! Over the next several weeks I’ll be participating in #etmooc, a MOOC defined as somewhere between a course and a community aiming to tend to the latter. #etmooc’s rather broad title is Educational Technology and Media. What’s attracted me is that it’s a connectivist MOOC or cMOOC in which over 1500 people will be working together, collaboratively and cooperatively, on the shared problems of education and society. The list of co-conspirators for the MOOC is long and varied, but the heart of the group of organizers is Alec Couros, whose passion for open, connected learning is huge. 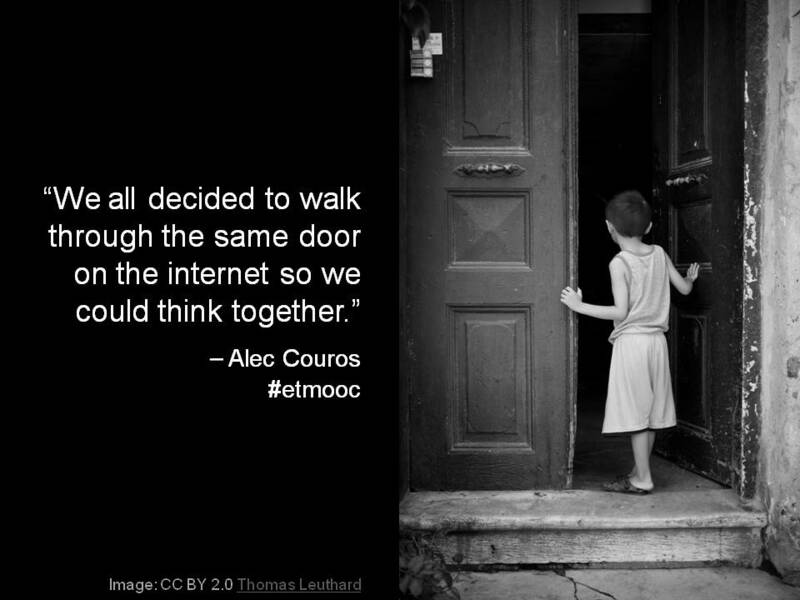 The topics we’ll explore in #etmooc are Connected Learning, Digital Storytelling, Digital Literacy, The Open Movement and Digital Citizenship. These topics are familiar to many of us — I explore many of them in my own teaching. But I’m hoping that #etmooc will be an opportunity to dig deeper, into the topics and into myself — my assumptions, my “well worn paths” of thinking — to challenge myself and to learn, in community. Next blog post, my #etmooc intro… coming soon! We connect, we learn, we move into the future together.